New York (July 19, 2017) – Having delighted generations of young readers and moviegoers, “Roald Dahl’s Charlie and the Chocolate Factory” opened on Broadway at the Lunt-Fontanne Theatre with a new take on the classic children’s tale for theater audiences of all ages. WorldStage is providing extensive video support for the new musical with a custom-fabricated Unilumin LED wall, a wide variety of Panasonic projectors, d3 Technologies’ media servers, and a BlackTrax real time movement tracking system. Video displays supplied by WorldStage are key elements throughout the show. An LED wall in Act 1 helps tell the story of the Golden Ticket Winners, while extensive projection mapping onto moving set pieces is a fixture of Acts 1 and 2. In addition, the BlackTrax movement tracking system is the behind-the-curtain star during a very whimsical oompa loompa scene. 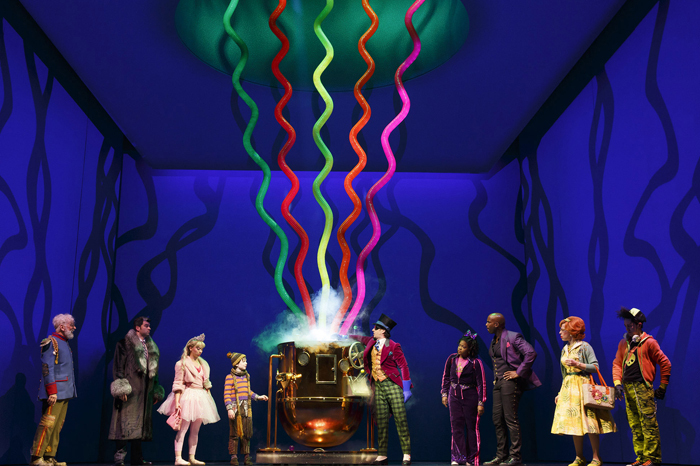 The LED wall in Act 1 helps narrate the story of the children who win the coveted Golden Tickets to tour the Chocolate Factory. Illustrative graphics displayed on the LED show the global locations the winners call home and serve as backgrounds for each child’s showcase song. Scenic design company Proof Productions built a custom framing structure to house the LED tiles. “The wall is roughly 14.5 feet in diameter and is made up of 18-inch square modular tiles, each slightly rotated in a fragmented array to create what looks like a deconstructed flat circle,” says Lars Pedersen. To handle the show’s projection mapping WorldStage furnished Panasonic projectors, including PT-DZ21Ks lamp units, and PT-RZ970 and PT-RZ12K laser-phosphor units. “We put together a fully-staged and choreographed number for the director, writer, and composer to get their approval,” says Sugg. “This was a great example of technology serving the art and not vice versa. Once I knew we were going to use BlackTrax then using d3, with its tight integration of BlackTrax, was a foregone conclusion.” As a bonus, BlackTrax also serves as a tool to quickly align and calibrate the projectors for all of the show’s video mapping. Sugg’s team includes Production Video Engineer Asher Robinson, Programmer Matt Houstle, and Associate Projection Designer Simon Harding. The animators who created the video content are Daniel Vatsky, Katie Kirschner, Gabriel Aronson, Michael Bell-Smith and Ian McClane. At WorldStage Tom Whipple was the Project Manager.